Good afternoon folks! Or, whatever time of day it happens to be where ever your home colony may be. 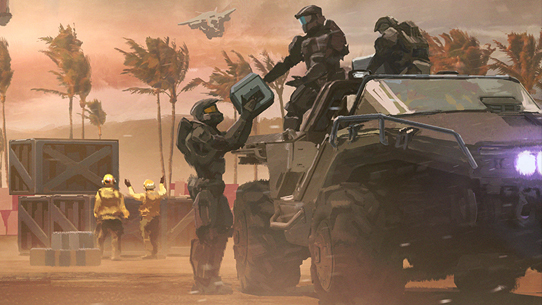 We’ve got a brief Community Update on tap today, just to let you know out of the gate – just a few tidbits and catch-ups from around the Halo sphere. Shall we begin? This week, we formally announced a pretty awesome little project we have going on in partnership from the Windows Mixed Reality team. Halo Recruit is not a game, but merely a fun toe-in-the-water effort in both exploring how Halo might fit into a broader MR/VRspace, and using it as a powerful vehicle to help show the potential of Windows MR.
Halo is in a unique position to experiment with and explore cool Xbox and Microsoft platform initiatives and technologies – similar to what folks have seen with things like the E3 2015 HoloLens experience and the Cortana personal assistant feature. Halo Recruit is a great example of this kind of collaboration. And speaking of collaboration, shout out to the awesome folks at Endeavor One, who we’ve partnered with on this particular introductory Halo experience! Halo Recruit is an intentionally simple and accessible MR experience, an experience you can try out for yourself beginning Oct 17 at Microsoft Stores all across the land. Plus, if you’ve got a Windows MR headset, you can download it and try it at homefor free (assuming you’ve got the right gear and specs, of course). It’s a short, sweet, and simplified experience overall for sure, but I’m not gonna lie, I still geeked out plenty the first time I saw Guilty Spark floating in front of me, or looked up into the gaping maw of a full-sized Sangheili model. It’s rad, and just a small step towards new ways to experience the Halo universe. Actually, speaking of Microsoft Stores, this weekend marks the third edition in their new grassroots Halo tournament series. On Sunday, Oct 8, a slew of select MS Stores will be hosting a 4v4 Halo 5 tournament, letting players in a huge array of locales show off their skills against some of the best local talent. Word has it there will likely be some high-profile Halo names jumping into the mix, from HCS Pro players like RyaNoob to content creators like LEGIQN. You can check out the details like participating locations, registration info, and more at our original announce blog right HERE. In the past, we said we were preparing to do a trial run allowing 12-player fireteams (to12) to match in the Warzone and Warzone Assault playlists. We included the caveat that a to12 could only ever matchmake with another to12, and that matchmaking would go on forever if another wasn’t available. Since then, we have added a matchmaking improvement that lets us potentially soften the requirements. The improvement allows us to impose a maximum skill gap between the teams that are created to play the match. Players that played in 12-player fireteams tend to have high individual matchmaking ratings (MMRs). With the new feature, when they matchmake as a to12, the resulting team MMR will be so high that only other to12s will likely have a combined MMR high enough to match them. We are therefore going to run the trial allowing any fireteam size up to 12, and not impose fireteam size restrictions. The new feature should be able to auto-adapt to different fireteam sizes. We still anticipate extraordinarily long if not indefinite wait times for players in larger fireteams, so it may be more “fun” in the long run to roll with smaller fireteams to be able to play more matches. We’ll be reading feedback on this, as well as monitoring how many larger fireteams play, and how easily they can get into matches. If the trial goes well, we may keep the settings this way. Keep in mind that if it turns out the trial is unsuccessful because larger teams can’t ever find matches, we aren’t going to relax the matchmaking constraints. We won’t sacrifice the experience of less-organized players by creating matches we know are clearly unfair. If this is the case, it means the 12-player fireteam population can’t currently support consistent matchmaking, and we’ll decide whether to leave it up with players knowing this, or taking it down so players aren’t misled into indefinite waits. Thanks Josh! And stay tuned to Waypoint and @Halo for more detailed info on exactly when these changes will go live. The Halloween season is just around the corner, and we know that plenty of Halo fans are always eager to make a Halo-helmed impression during their candy-collecting cavalcades. Earlier today, we caught up with the Halo Consumer Products team to put together a helpful little guide to the myriad of options out there to make those dreams come true. Check it out at the link below. Mile-high Mayhem – The HCS Fall 2017 Finals at DreamHack Denver is nearly here! Make sure you head over to the official Event Hub for all the latest info. Put Us on Ice – Want another chance to nab that fab and frosty Ice Unicorn weapon skin in Halo 5? Jump into the H3 Classic Throwback playlist in Halo 5 on Monday, Oct. 9 from 2-3 PM PT – if you match up with our squad of 343 denizens during the appointed hour, then you will snag the skin. See you then! That’s Not What It Means, Stop It – As teased earlier this week by yours truly, our friends at Dark Horse are releasing an awesome Halo Adult Coloring Book next week on Oct 11. Books Abroad – Guess what? The already much-beloved Halo: Warfleet is now available in the UK! This spaceship-focused beauty is a Halo fleet-fan’s dream, with a ton of new info and never-before-seen looks at both classic and new craft alike. If you haven’t gotten your hands on it already – or have been chomping at the bit waiting to – jump on it now! It’s Pretty Meta, or is that Mega? – If you happen to be at the New York Comic Con, make sure you hit up the Mega Construx booth (#1936) to check out some really cool Halo related happenings they’ve got on hand to experience. We’ve got some really awesome community contributions this week to go over, from amazing montages and videos to ridiculously cool screenshots focusing on last week’s featured theme: the Flood. Let’s check out all the goodies! We kick things off with UberNick’s Halo 5 montage “Turbulent.” Edited by Elzie (who is ridiculous), this thing is a gorgeous sight to behold with awesome gameplay, music, and editing. Definitely give it a look. 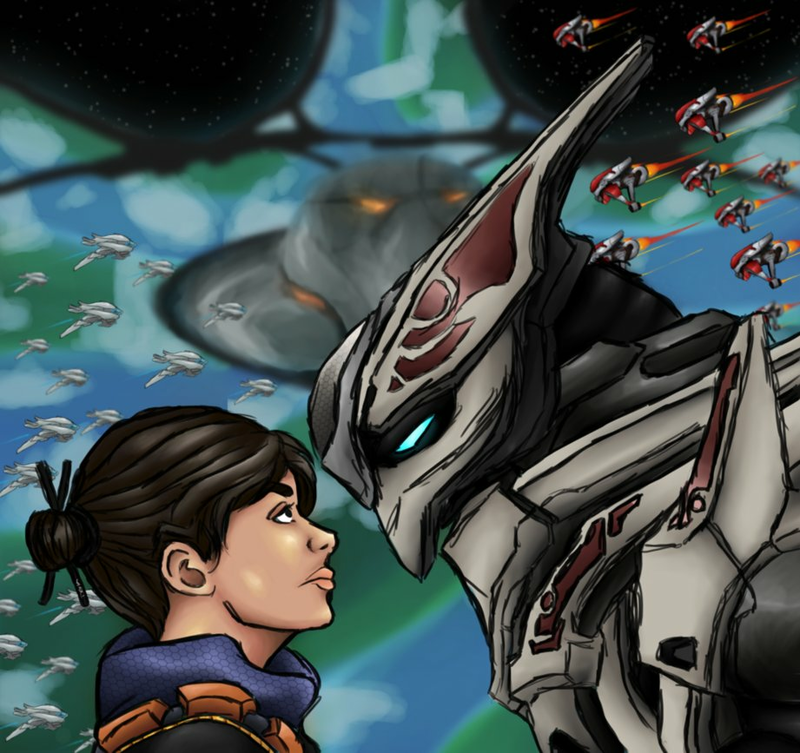 Next up is artist darjingwriter, who made this really awesome piece depicting Professor Anders and an Elite Ultra squaring off above the Ark. HaruspexOfHell has a really cool new blog piece where he explores the idea of “Military Noir,” and how he feels it helps define Halo. You can check out the full piece HERE, and an excerpt below. "Oftentimes, Film Noir movies depict characters that are trapped, figuratively or physically. It creates a certain mood of an impending doom that is out to get them. "And well, in a universe such as Halo. There's often a lot of characters that face similar dilemmas, such as the dilemma of the Insurrection, which in all intents and purposes proposes the idea that you're trapped under the behemoth of the Unified Earth Government. "Forever to be a slave to the system. And this entire pessimistic perspective is heavily present in other aspects of the Halo Universe as well. Such as the case with Truth, trapped in the system with his lies. The lies that will lead to the inevitable doom of his beloved Covenant." As mentioned earlier, last week we put out the call for Flood-themed screenshots, and boy did quite a few folks deliver. Let’s take a look at a few of our favorites! 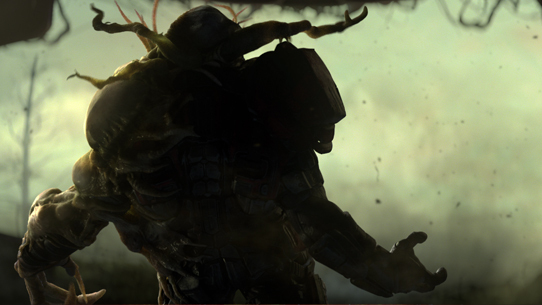 Next round, we’ll be looking for, hmm… how about Brutes? Send along your best Jiralhanae-themed screenshots to us on Twitter (@GrimBrotherOne, @ske7ch, @Unyshek, @Halo, etc) and make sure you use the hashtag #HaloHotShots for easy searching. With that, we’re out. Have an awesome weekend, and show some love. 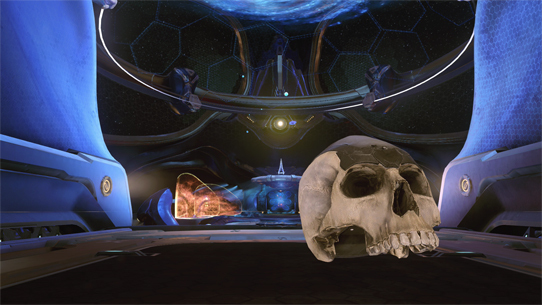 Until next time… Live well, play Halo, and be excellent to each other. What’s up, you handsome and heroic Halonians? It’s that time again, time for us to deliver a patiently portioned pallet of newsy bits and bobs for you to CTRL+F, dissect, discuss, and discern. It’s a revered galactic pastime, really. Today we’ve got an eclectic assortment of happenings to hit on, so let’s not waste another moment.